Back in 2013, Mammatus emerged from a 6-year hiatus with the mindblowing album Heady Mental, an album that took the band into definitely more spacey territory than their earlier releases. Just two years later, the band returns with their most ambitious album to date, the mostly instrumental Sparkling Waters; a double album consisting of just four tracks, all over 15-minutes in length. 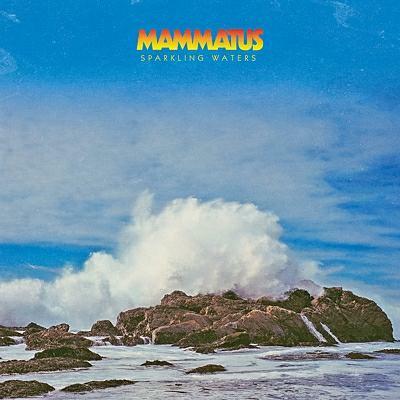 Mammatus continue to embrace their spacier inclinations, but the album also has a much mellower vibe than past releases. They described their debut self-titled album as “the final battle between amps and sea monsters”. It seems the battle is over, and Mammatus have found a more peaceful state of mind. The 22-minute long Sparkling Waters Part 1 opens with almost 5-minutes of layered drones, beautiful, melodic swells and wind chimes. Those worrying that Mammatus may have evolved into some kind of new age band or something need not worry, though, because at this point the full band kicks in with their trademark guitar arpeggios and complex rhythms which slowly dissolve into a lengthy, breathtakingly gorgeous passage of echoing guitars, spaced out synths and recorder. This is music that really takes you somewhere, whether you think that might be the shores of the Pacific Ocean or the shores of the universe. A slow build takes this one to it’s amazing conclusion, with cosmic voice choruses and a truly exhilarating, spiraling guitar freak-out that will take you off those shores and outward, over the sparkling waters. The band has come a long way from their days of dark, doomy sludgery, to a sound that is infused with light and positive vibes. The 20-minute Sparkling Waters Part 2 doesn’t so much pick up where Part 1 left off, but establishes itself as an entirely new piece while still continuing the journey. We’re greeted with the sound of crashing waves and a surprisingly chilled, gently loping electronic pulse that plays over deep, ambient space synths, carrying you drifting across the cosmic ocean deeper and deeper into space and time. At 12 1/2-minutes in, a deep, ringing guitar chord announces a change as the band kicks into a slow, Sabbathy kind of groove, but one that eschews the darkness for a more transcendent feel. It’s full of sludgy noise, but what a beautiful, sludgy noise it is! These two tracks alone would make for a fine album, but there’s still much more to come. The 15-minute track, The Elkhorn, returns to the heavier rocking sound of their previous albums, but with complex, cyclical guitar lines and spacey, pulsing synths driving through it, it at times sounds something like Tangerine Dream, but with heavy guitars. It makes for one hell of a space rock ride, that drifts off into a 4-minute long soaring, ambient space trip at the end. And then we come to the final piece, the 17 1/2-minute Ornia. With its buzzing, fuzzed out guitars, you would think this would be a much heavier piece, but it’s shot through with dazzling, soaring melodies that make it both heavy and mellow at the same time. It’s a remarkable balancing of tones. The piece goes all ambient in the middle with fuzzy swells of noise, waves, and languid, almost melancholy guitar melodies. This slowly evolves into a gentle, jazzy, rhythmic exploration with laidback wah-wah guitars, recorder and piano, as well as a ton of space effects. The band can’t contain themselves though, and suddenly break into a stunning space funk jam for a breathtaking, spectacular finish. After two years, Mammatus returns and they do not disappoint. Sparkling Waters can be enjoyed on a number of different levels, from meditative to heavy rocking; from spaced out to just plain freaking out. Mammatus evolves with every release in new and exciting directions, and this one is no exception. Highly recommended!